I want to get it out of the way and say that nothing out of the ordinary happened while I was in City Hall Station. That’s not to say that I couldn’t feel something down there. Whether it was residual memory, or just residual cold from the snow the night before, there was something down there. If a “well” felt like something, well, I know what it feels like now. The word “haunted” has a negative connotation, but that’s how it felt down there. Not in a horror movie way, more like a lot has passed below those arches over the centuries, and some things never left. No, nothing out of the ordinary happened while I was in City Hall Station that would help us further along the events taking place with what we’ve come to call the Secret Society. It all happened after I left. The strange sounds in the videos I took, the notification I received nearly 24 hours later on my phone, (one word, “betrayer”) and the picture at the end of this video… the one I found in my camera roll last night. The one I didn’t take. Yeah. So something was definitely down there. But I don’t know what, and honestly, I don’t know if it has anything to do with us. I dreamed about visiting that place for so long. It certainly didn’t disappoint, but we’ve also seen and experienced a lot of wondrous things together over the past few years. Why I still feel so drawn to that place, now almost three days later, I don’t know. Maybe I always will. That photo, the one I didn’t take, it’s a prized possession now. That’s Saberlane there, the one I lost to the storm, still looking up. No word yet from Woolie, but we’re waiting. I’m worried though. He may be gone already. We’ll keep you all posted. We ended up archiving them because we’d save all the images and captions, and the Mounties had as well. You know what we didn’t do? We didn’t check the comments. 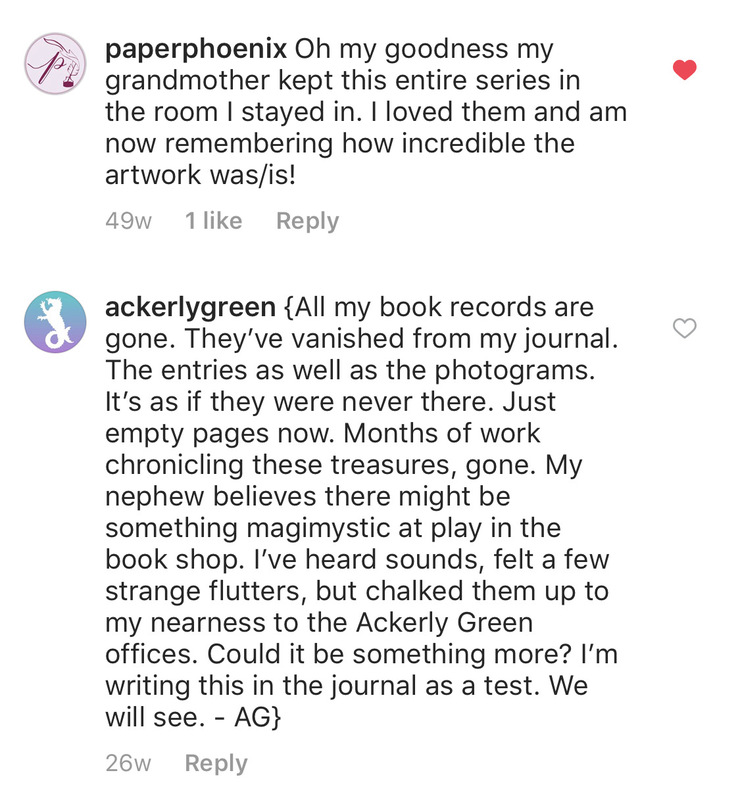 So… it seems the journal Catherine took home belongs to “A.G.” and A.G. is apparently Evelyn Avis Green. And Evelyn Avis Green is someone’s unexpected sibling? 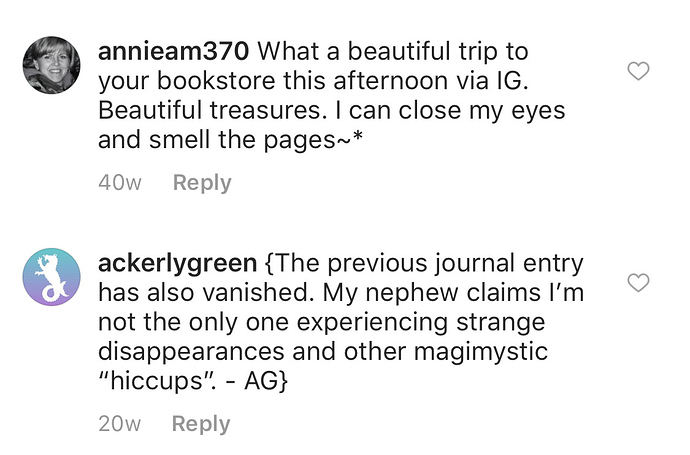 We’ll keep digging through the Instagram archive. Ok sorry, starting at the beginning. “It seems others with magimystic sensitivities have experienced strange occurrences of late, though my nephew isn’t convinced it’s necessarily limited to those with knowledge of the Arcanum, only that they’re more keen to accept disappearing objects and strange sounds as magimystic. But there have been enough observed and recorded instances in a small amount of time that it’s impossible now to believe it’s not a coincidence. I called @Saberlane and we both agreed that the proximity to AGP might be triggering it. He already went home because he “has a family” and “needs to acknowledge their existence at some point” so it’s just me here right now. I don’t know if more entries are going to appear, but I’m going home for a hot sec because it’s getting late and I’m starving but then I’m coming right back with some snacks and comfier clothes to see what I can make of this. Wish me luck, I think I might be here a while. Okay, this is a big one, over two pages and I’m not sure I got it all, it was disappearing behind me as I read and rewrote. I don’t know if I got it 100%. My dear nephew is a genius. If the first plan fails, stopping whatever is happening or whoever is responsible, then we will need a second plan to buy more time. He and his friends are working on a stopgap spell that I have been asked to help cast when all is ready. He says that my being a Green, and casting it here at Ackerly Green is essential. So despite my reservations, I’ll help. As he explains it, if magic reaches a predetermined nadir, and the memories of those fighting to protect it have continued to degrade, then using the wells as measuring devices, the tripwire will snap, and the spell will theoretically cast itself without the help of a magimystic, using the company as its safest center since it is a powerful well. The spell will use whatever it can reach, the people, places, wells, and objects in its surroundings to protect what’s left of magiq and give those still fighting for it a chance. He says I’m important to creating it but is too busy to explain how right now. He and his friends are grimly excited and feverishly working all hours to bring this about. I can do nothing at the moment but tend to the books and be with Fina. My two loves. Whoah. Could magic disappearing from our era have somehow triggered The Last Figuration from theirs? How could that have happened? 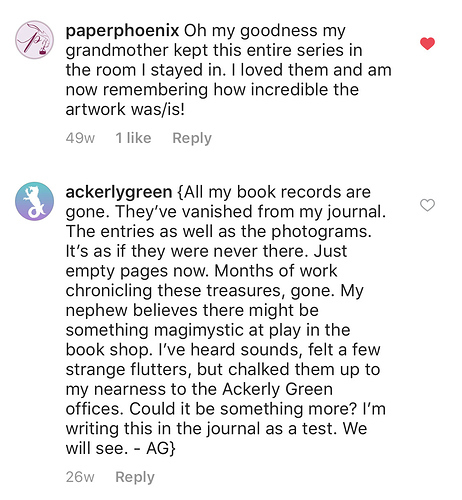 It’s kind of amazing that because of all you’ve all been through you can read journal entries from a previous version of our world detailing how it ended and be like but also “let’s get to work.” You guys are the best. I’m trying to get my head around the reality of the “era books” and who lived when and how… maybe I’ll come up with something, a primer or a diagram or something, and you can punch holes in it based on experience or pure conjecture? I think it might be helpful for those coming in to all this fresh who want to help but don’t know where to start? I’m just eager to help climb the and this seems, as an outsider, a good place for me to start? Especially considering that a lot of the Low’s theoretical view of all this also deals with some form of “alternate history” so I’m at least versed in what others on the outside see this as possibly being?